Land and soil provide vital resources to society such as food, feed, fuel, fibres and shelter. They also provide ecosystem services that support production functions, regulate the risk of natural hazards, and provide cultural and spiritual benefits. By using land, society alters and modifies the quantity and quality of these services, and the intrinsic potential for land benefits to mankind. To better manage its use of land and associated processes, society needs a systems (i.e. integrated) view on land. This briefing proposes an analytical framework that aims at developing a strategy for monitoring and integrated assessment of the state of land and its key resources. A number of land processes are related to environmental issues in Europe such as land take, soil degradation, biodiversity decrease, land abandonment and the decline in ecosystem services. A comprehensive land systems approach is required to tackle the complexity of the problems associated with land processes. Changes to land systems need to address both human and environmental aspects of land use and are better understood through integrating territorial, dynamic and functional assessments. 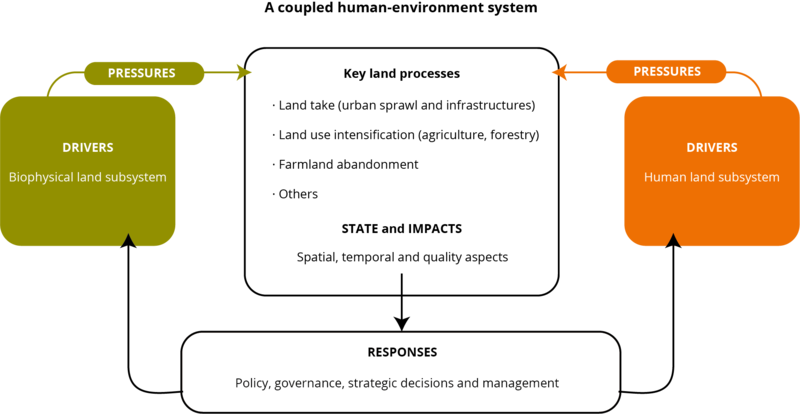 The land systems assessment approach needs clear policy drivers, such as a policy implementation cycle that combines drivers, pressures, state, impacts and responses (DPSIR) in a cause-effect framework. Copernicus land monitoring products are progressively enhancing access to relevant spatio-temporal land use information. Land systems are the terrestrial component of the Earth system, encompassing all processes and activities related to the human use of land. These include socio-economic, technological and organisational inputs and arrangements, as well as the benefits gained from land and the unintended social and ecological outcomes of societal activities. The land systems concept combines land use (the activities, arrangements and inputs associated with land use) with land cover (the ensemble of physical characteristics of land discernible by Earth Observation). Changes in land systems have substantial consequences for the local environment and human well-being, and are pervasive factors in regional and global environmental change. Therefore, land management — such as the methods and intensity of land use — is an important aspect of land systems. Land use policies are essential to successful land management. Some European Union policies frame conditions for land use, e.g. the Common Agricultural Policy. Other policy initiatives will affect land use in the coming years, including the EC no-net-land-take policy by 2050, a new EU regulation for land-based carbon accounting (land use, land use change and forestry), renewable energy goals, the NATURA2000 network, the Water Framework Directive and the EU Biodiversity Strategy 2020 target to maintain and restore ecosystems and their services. At international level, the sustainable development goals (SDG), in particular SDG 15, will also have an impact on land use by, e.g. reducing land degradation to zero. The question this briefing attempts to answer is how to put into practice an analytical framework to assess the state of land systems, the trade-offs resulting from policy decisions and the impacts of observed changes. The proposed answer lies with a land systems approach, i.e. an integrated assessment method for monitoring and analysing the state of land and its resources. This should address multiple land functions (i.e. the gain or loss of expected services and benefits) and services (i.e. the positive or negative effects of ecosystems on humans) that occur simultaneously. To achieve this, land analysis (with its biophysical and human subsystems) must be multidimensional, covering space, time and the relevant aspects of sustainable functionality. The effectiveness of environmental policy depends on the monitoring and assessment of targets, be they halting biodiversity loss, environmental pollution, soil degradation or land take. These issues often relate to land processes that are key elements of a land system (Figure 1). Current and future demand for land-based goods and services in Europe are associated with major land processes: land take for urban and economic use, intensification of agricultural and forest land use, and agricultural land abandonment (which often gradually changes into forest land) . These are complemented by nature protection and conservation that, together with climate change impacts, widely affect land and act as additional land processes. Drivers from both biophysical and human land subsystems are at the origin of these land processes. They act through the pressures and ultimately lead to changes in the state of the land, and result in impacts to society and ecosystems. These impacts need responses that feed back into development drivers, closing the cause-effect loop. The implementation of the land systems concept should be feasible and should accommodate the DPSIR framework within three assessment dimensions: a territorial assessment that integrates the spatial distribution of land attributes (e.g. vegetation types); a dynamic assessment that observes spatially distributed land attributes in time; and a functional assessment that involves the role and services provided by the land system and its impact on other systems (Figure 2). This approach to land systems assessment aims to show complex patterns and trends in land system change, and how this change affects the benefits humans derive from land. Proposals to analyse the spatial patterns of land systems  and to measure their trends over time have been made. However, the integration of these spatio-temporal analytical frameworks into the functional assessment of land systems needs improvement. The integrated assessment proposed in this briefing aims to overcome this limitation. Understanding this complexity is important in the design and implementation of context-specific and effective policy measures , but also in assessing the impacts of land system changes on biodiversity and ecosystem services. Finally, it can contribute to understanding the drivers behind the spatial, temporal and qualitative dimensions of land processes. The implementation of a land systems assessment is based on an integrated territorial, dynamic and functional assessment of land processes. Due to constraints in data availability, however, the monitoring of Europe’s land systems has been limited to land cover change. More detailed data and indicators are, nonetheless, becoming available allowing for more systematic assessments: statistical time series of land management inputs, Copernicus land monitoring data, Land Use and Coverage Area frame Survey data   and data from the Land-Parcel Identification System in the EU countries. Improving data inputs will extend land systems analysis by including the functional impacts of land use related to soil and land quality, as well as ecosystem conditions. The analytical steps of the land systems assessment approach from Figure 2 are elaborated in more detail below. To become more effective and efficient, the EEA’s land assessments should better link research work with decision-makers’ priorities. The proposed analytical framework must answer critical policy-relevant questions such as: What are the impacts of agricultural intensification on land system components and the spatial configuration of land use? In which landscapes should additional land take be prevented to avoid passing a tipping point in the justifiable functioning of land? Key drivers must be identified and the resulting relevant environmental pressures explored. Such pressures correspond to land processes in the human-environment land system. Land processes represent the central elements of the analytical framework and are defined as physical, biological or chemical processes that directly influence changes in ecosystem functions and services. They can be mapped by Earth Observation such as Copernicus land monitoring products (CORINE Land cover and land cover change) combined with spatially distributed statistical data on socio-economic activities, including farming inputs per unit of Farm Accountancy Data Network or Eurostat territorial statistics. Other land processes are driven by biophysical factors, namely extreme weather events (e.g. climate hazards such as drought and/or forest fires) or biological dispersal (e.g. invasive species) and may require inputs from spatial modelling or in situ monitoring. Land systems have a specific spatial structure that refers to the type, magnitude and spatial pattern of land use in a bounded assessment area and is dependent on the scale of analysis. The territorial assessment describes land systems as a state of natural capital and a socio-economic purpose of natural resources. This includes land management practices, such as the arrangements, activities and inputs people undertake across regions. From a practical perspective, this includes analysis of the spatial distribution of land use and land cover (LU/LC) patterns, the local and regional variances of land management practices, the degree of imperviousness and soil sealing and the existence of conservation and non-conservation areas. A territorial analysis results in map categories, which represent specific characteristics of land processes e.g. intensity levels of agricultural land use, forest management practices or peri-urban land take at a given time. As an example, four cropping indicators were derived from MODIS NDVI and a self-organising map approach was used to identify typical agricultural intensity patterns across Europe. Changes in the state of land systems can be measured from land cover flows from one broad LU/LC category to another. Qualitative intensity changes within land use categories are less well known. However, both types of land process result in changes in the services and goods provided by land systems. A dynamic assessment, therefore, focuses on the description and interpretation of land processes as: (1) conversions among broad LU/LC categories (e.g. deforestation, agricultural expansion, land recycling) that lead to changes in the territorial extent of these land types; and (2) changing management practices (e.g. changes in mechanisation, fertiliser application, or wood harvesting), resulting in intensity changes within the extent of these land types. At this step, the analytical framework allows patterns of temporal land system changes occurring at distinct geographical regions to be identified, e.g. an increase in agrochemical inputs and conversion to more intensive land use, but also withdrawal of farming through a reduction in farming interventions and abandonment or naturalisation/rewilding. Spatial patterns of changes in the extent and management intensity in Europe’s agriculture, forestry and urban areas for the period 1990–2006 have been mapped. A methodological approach based on high-resolution and spatially explicit indicators has been used to identify land use change hotspots and assess the spatial congruence between land use change processes. Despite the moderate overall rates of change, many regions in Europe fell into at least one land use change hotspot during the 1990–2006 period. This was often related to a spatial reorganisation of land use (i.e. co-occurring area decline and intensification or co-occurring area increase and extensification). This step measures impact, i.e. the effect a land process has on the delivery of environmental functions. For example, intensification of agricultural land use that encourages soil loss by erosion and the degradation of soil quality represents a threat to many land functions and may lead to a decline in ecosystems services based on these functions. This analytical framework compares the provision of functions and services across geographical regions, taking into account that they occur within different land use types and are subject to contrasting management activities evaluated in steps 3 and 4. Examples include soil functions, e.g. biomass production, storing and filtering capacity or acting as a carbon pool; land functions, e.g. food and feed production, recreation potential or aesthetic information; and ecosystem services, e.g. habitat quality, pollination potential or net ecosystem productivity. A conceptual model to score soil functions and ecosystem services and compare them across broad types of conventional, conservation and integrated agricultural systems has been developed. The work revealed that the overall agro-environmental score is largest for conservation systems and smallest for conventional systems. The benefits included water availability for crops, weed control, insect and pathogen control, soil quality and functioning, soil erosion control, soil organic carbon pool, environmental pollution control and greenhouse gas refuse (emission). At the same time, the crop yield productivity score is highest for integrated systems and lowest for conservation systems. The outcome of the assessment steps should provide an answer to the policy question posed in Step 1, and inform responses to specific pressures on the land system. To illustrate, a potential analytical outcome of the proposed framework could suggest that a land process such as ‘agricultural land use intensification’ provides increased ‘food, feed and energy production from biomass’ in a specific geographical region, but also increases ‘soil contamination’ and decreases ‘habitat quality’ for animal species. When presented with sufficient spatio-temporal detail and complemented by functional implications, a concrete statement (or a set of key messages) based on the land systems assessment will contribute to formulating policy measures. The proposed analytical framework applies systems thinking to the land topic. It uses the interdisciplinary concept of land systems and aims for an integrated assessment strategy for monitoring the state of land and its resources. Key challenges are related to constraints in data availability and scientifically sound methodological approaches to measuring the sensitivity level of trade-offs between environmental supply and socio-economic demands (i.e. biophysical and human subsystems of a land system). The outcomes of an operative land systems assessment approach should identify regional differences (territorial aspect), track changes over time (dynamic component) and provide information on the changing qualitative properties of land resources that are altered by important land processes (functional component). The properties of land systems are addressed by linking them to the land functions that are largely determined by soil functions and the inherent provision of ecosystem services. Increasing amounts of remote sensing data, particularly those disseminated through the Copernicus programme, will enhance the accessibility of relevant information for use in land use management for the benefit of sustainable land resources in Europe. Using high-resolution satellite imagery in combination with statistical data collection and in situ ground monitoring data will enable better estimates and understanding of variation in land functions at the field scale across the EU. This will also bring out more detailed spatio-temporal patterns in land management intensity and their impacts on nature and the economy. EU policies that govern land management and secure protection of nature and ecosystems need integrative concepts and underpinning methodologies to track progress towards the sustainable use of land and soil resources. The proposed analytical approach builds on a currently existing knowledge base and aims at overcoming the fragmentation of available assessment methodologies. The proposed approach could also support more balanced spatial planning and territorial coherence in the context of governing urban, peri-urban and rural areas. EEA, (2017). Landscapes in transition. An account of 25 years of land cover change in Europe. EEA Report No 10/2017. Copenhagen: European Environmental Agency, pp. 84. BIO Intelligence Service, IVM and IEEP (2015). Support for the preparation of the Impact Assessment Report on the Land Communication – Problem definition and possible areas for EU action, prepared for the European Commission (DG ENV). Ellis, E. and Ramankutty, N. (2008), “Putting People in the Map: Anthropogenic Biomes of the World.” Frontiers in Ecology and the Environment 6: 439–47. Václavík, Tomáš, Sven Lautenbach, Tobias Kuemmerle, and Ralf Seppelt (2013), “Mapping Global Land System Archetypes.” Global Environmental Change, 23, 1637–47. Levers, Christian, Daniel Müller, Karlheinz Erb, Helmut Haberl, Martin Rudbeck Jepsen, Marc J. Metzger, Patrick Meyfroidt, et al. (2015), “Archetypical Patterns and Trajectories of Land Systems in Europe.” Regional Environmental Change, December. Rounsevell, Mark D.A., Bas Pedroli, Karl-Heinz Erb, Marc Gramberger, Anne Gravsholt Busck, Helmut Haberl, Søren Kristensen, et al. (2012), “Challenges for Land System Science.” Land Use Policy 29 (4): 899–910. Foley J. et al. (2011), “Solutions for a cultivated planet”. Nature 478:337–342. Buck O, Haub C, Woditsch S, et al. (2015). Final report: Task 1.9 - Analysis of the LUCAS nomenclature and proposal for adaptation of the nomenclature in view of its use by the Copernicus land monitoring services. Orgiazzi A, Ballabio C, Panagos P, Jones A, Fernández‐Ugalde O. LUCAS (2018). Soil, the largest expandable soil dataset for Europe: a review.European Journal of Soil Science. Maes, J. et al., 2018 Mapping and Assessment of Ecosystems and their Services. An analytical framework for ecosystem condition. Publications office of the European Union, Luxembourg, 75 p.
 Nelson, G.C., Janetos, A., Bennet, E. (2005), “Drivers of change in ecosystem condition and services”. In (Carpenter, S. R., Pingali, L. P., Bennett, M. E., and Zurek, M.B. eds) Scenarios Assessment of the Millennium Ecosystem Assessment. Island Press. London. Chapter 7, pages 174-222. Kuemmerle, T., Levers, C., Erb, K., Estel, S., Jepsen, M. R., Müller, D., Reenberg, A. (2016). Hotspots of land use change in Europe. Environmental Research Letters, 11, 064020. Stavi, I., Bel, G., & Zaady, E. (2016). Soil functions and ecosystem services in conventional, conservation, and integrated agricultural systems. A review.Agronomy for Sustainable Development,36. The country assessments are the sole responsibility of the EEA member and cooperating countries supported by the EEA through guidance, translation and editing. For references, please go to https://www.eea.europa.eu/themes/landuse/land-systems/land-system-at-european-level or scan the QR code.